Last year I had the joy of attending Sotto Sopra Restaurant’s evening of holiday songs. They created an ensemble of their Broadway Night singers for an evening of the holiday season’s most beloved songs. The live performances in this stunning venue really set the tone for 2017’s holiday season. 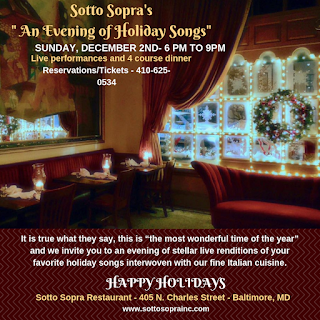 Lucky you, they are doing an Evening of Holiday Songs and a Four Course Dinner, Sunday, December 2, 2018 starting at 6 pm.